Even the most righteous man sins in the face of an open treasure. Maxim. The VII song of the Odyessy tells of the myth of Ulysses. He was warned by the goddess Circe that travellers on the sea, in hearing the song of the sirens, would be attracted by the song, lose control over their boats and go mad. Ulysses asked that he be tied to the ship´s mast, that the rowers have their ears plugged with wax, and ordered that if he came under their magical spell and asked to be untied, that instead they should tighten the knots. Thus it was that Ulyssess and the rowers were saved, and the Sirens, seeing that they had failed, threw themselves off the cliff. 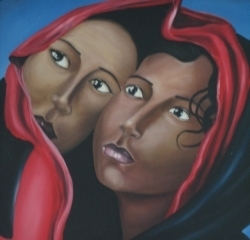 In the face of unfair commercial intermediation, Fair Trade (FT) emerged as an alternative so that people might organize, improve their lives, and create a space of solidarity among different actors transcending borders. Nevertheless, the institutionality of the power relations, like the “sirens”, is capable of seducing the FT system, turning it against its own principles, and turning solidarity into just a bunch of words, numbers and papers. What makes this happen? How can FT “tie itself up” and avoid falling under the spell of the “song of the sirens”? To respond to this question, we assume as given that there are exceptional cooperatives, organizations and people that prove the importance of being organized and of cultivating global solidarity. Nevertheless, in this article we study certain practices of this FT system that seem to indicate its decline, and on that basis we suggest that FT can reinvent itself. To do so we focus on coffee that constitutes 70% of everything that FT sells. The FT movement began in 1964 within the framework of the United Nations Conference on Trade and Development (UNCTAD). Since then, various European countries have promoted UNCTAD stores, selling products from developing countries. Later the “solidarity” store chains got started. In 1973 FT coffee trade was launched with Guatemalan cooperatives under the brand of “Indio Solidarity Coffee”. In the decade of 1980s the volume of products increased and their design improved: in the solidarity stores mixtures of coffee, tea, honey, sugar, cacao, nuts, bananas, and flowers were sold. In 1988 Holland began the “Fair Labelling” seal of Max Havelaar and in 1997 they formed the International Fair Trade Organization (FLO). And since 2012 the decisions in FLO have been made with 50% of the votes of organizations on three continents (The Latin American Fair Trade Coordinator of Small Producers, Fair Trade Africa and the Network of Asian Producers). Those represent 800 organizations and 1 million small producers in 60 countries in Africa, Asia and Latin America, with the other 50% of votes from 21 national brands in Europe and the United States (Mendoza, 2012a).. This FT boom was accompanied by internal crises. First, a debate started in 2001 that ended with a division in 2011 when FT in the United States (FT-USA) withdrew from FT international (FLO). FT-USA proclaimed “fair trade for all”, proposed increasing the volume of coffee exports on the basis of by including large plantations (large producers), so that it might also benefit the workers on those plantations; while FT International (FLO) decided to continue working with the small producers (see Mendoza, 2012a). Second, the FT seal is facing increasing competition. Various seals have emerged offering different attributes, which is why the FT seal is losing its attractiveness to consumers. Within this context, in the last two years large coffee buyers which had displayed the FT seal, like Green Mountain, have dispensed with the FT seal. Third, many buyers and increasingly coffee roasters are embracing the “direct-trade” approach instead of “fair-trade,” because they are looking for better quality and ecological coffee, and above all, because they want the producers to get the price differential that they offer, instead of that amount getting stuck in the organizational structures. Fourth, international aid, which also financed (donated) activities to the FT system and that “trickled down” significantly to the members, has been substantially reduced to Latin America. This has contributed to the fact that the members are now asking about the benefits of FT. These four factors are correlated to internal factors of FT, forming a system that shapes, and at the same time is shaped by, the actors. This takes us to the relationship between structure and actors. The structural perspective on its own runs the risk of determinism, while only looking at the actors and their actions runs the risk of voluntarism. The structures are expressed in rules and norms, collective and persistant phenomena. They are like the “current under the ocean,” while the social actors are like the ocean waves, producing and reproducing the structures. The structures limit and facilitate the action of the social actors; it is where reciprocal relationships exist between individual and collective actors. In this article we focus on that relationship between structures and actors. In what follows we present the innovative character of FT, its later decadence, explaining why this change happened, and in the end we present a path for FT to enter into its second generation. There are at least two major obstacles to getting out of poverty: the lack of organization among the producers, and the intermediation network. The former refers to people who operate within the “extended family” institution. It is a protective and paternal network that keeps the members´condition from getting worse. But in terms of improving their lives, it keeps them from organizing in other scenarios that would imply abandoning that family institution. It is an institution that distrusts other forms of organization, because it has been shaped to resist the systematic pursuit to dispossess them, such as – the State’s actions with regard to indigenous lands in the nineteenth and twentieth centuries, the monocropping system of sugar cane, cotton, coffee, cattle, wood… The latter refers to the intermediation network that combines usury, low prices and deception in determining product weight and quality, mediated by relationships of loyalty (submission) under the maxim, “you are really poor when don´t have anyone to exploit you”. Both factors, the lack of organization or atomization of the producer families, and the commercial-financial intermediation, produce poverty and inequality. In light of both the lack of organization and the intermediation, FT responds with an holistic approach as an expression of an alternative path. 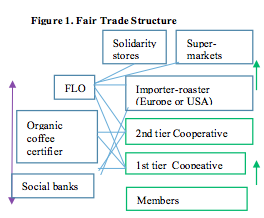 Figure 1 shows the entire FT system: on the right side is the chain of actors that revolve around coffee, and on the left side are the organizations that support part or all of the chain. Using the “principal/agent” approach of institutional economics, where the principal defines the policies and rules and the “agent” executes them, we see that there are multiple principal-agents in the chain who interact among themselves (see purple arrow). In the case of the cooperatives (see green) the members through their assemblies are the “principal”, their leaders are the “agent”, who in turn are the “principals” in their relationship to the management and staff, who in this case are the “agents” (see the green arrow for the logic of the member families who create their medium, the cooperatives). In FT the members of FLO through their assembly constitute the “principal”, and the FLO-CERT certifier the “agent.” For the certifiers of organic products, the laws of the US, Europe, Japan or China are the “principals” and the certifiers the “agents.” More importantly, FT principles – and not those of the market – are the “principal” in terms of building justice in favor of the indigenous-peasant producer families. 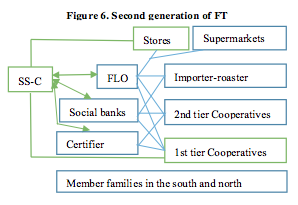 Consequently there are four factors that distinguish FT. First, so that the producers can avoid usury and supply the product, the members of the cooperative receive credit through their cooperatives, capital that comes from the social banking sector (at 9% interest rates), and from coffee buyers (businesses, stores and solidarity cooperatives in Europe and in the US). A good part of that credit is prefinancing at 50% of the value of the product that they are going to buy at an interest rate of 0%. Secondly, to keep the producers from falling into extreme poverty due to a drop in coffee prices, and to incentivize sustainable agriculture, FT sets US$1.40/lb as a minimum price when international prices are below 1.40/lb, provides a US$0.20/lb additional bonus to the market price, provides a US$0.30/lb premium for organic coffee and frequently will reward the quality of the product with an additional amount. Third, so that the product is traceable and trust is built into long term relations, there are organizations that certify in situ compliance with the agreements and policies. For organic coffee it is done by international certifiers, for the bonus and FT practices FLO CERT does it. The buyers – in addition to requiring a coffee sample and a certain product quality – adher closely to the certifiers and to the financial analysis procedure of the social banking sector. Fourth, FT establishes a direct relationship between consumers and producers, where the earnings of FT are managed by the producers themselves, reinvesting them in their communities (see box). FT, in addition to the economic aspect, is also social, political, environmental and cultural, as its 11 principles indicate: FT favors opportunities for economically disadvantaged producers, organizational transparency, positive commercial relations, payment of fair prices and salaries, no child exploitation, gender equity, decent working conditions, strengthening of capacities, promotion of fair trade, protection of the environment, and the preservation and protection of cultural identity..
What stands out here is the combination of trade, finance and production within a structure of a multinational organization of North-South counterparts, with a plural framework of principles that prioritize equality and equity. This gets families to organize, improve their production, their lives and identity in the family and the community, and “creates a more direct relationship” between producers and consumers. FT is a space for transnational learning and social, economic and environmental transformation, with an enormous commitment from countries of the North to countries of the South, from consumers to producer families. After half a century of FT, what has happened? We argue from the side of the peasant families – producers and their cooperatives – that FT is regressing, it taking a path that only appears to be “fair” – like Plato would say, as quoted at the beginning of the article. 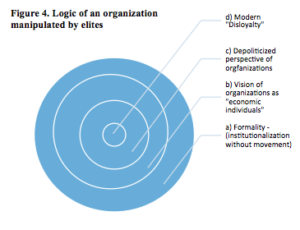 Following Figure 3, to that extent that a cooperative practices each one of the four ploys, legitimized by the rest of the FT system and maintained by the glocal (global and local) power structures manipulated by the elites, that cooperative moves from crisis to demise. Meanwhile – in a parallel fashion – it is privatized and managed by ideas commonly known as neoliberal ones, adverse to peasant-producer families. Said figuratively, when a cooperative begins to fall into these ruses, it starts rolling downhill without brakes or wedges to stop it. Returning to the principal-agent approach, this time observing what really happens, we argue at first glance that small groups of cooperatives of the FT system have formed a type of informal network, turning themselves into the “principal” and the intermediate leaders and officials of different organizations into the “agent.” At second glance, the people are hidden behind the organizational structures and their FT principles. At third glance, the principles of the “invisible hand” (market) have become the “principal” and the FT system the “agent.” At fourth glance, we confirm that the FT members, consumers and principles do not count. In what follows we will analyze each one of the ploys (2.1), the FT multinational framework that contributes to the cooperatives falling into these ploys (2.2), and the power structure that sustains and shapes the cooperatives, while also hollowing them out. Once an organization is trapped by one ploy, it pushes that organization to the next one. Once it is trapped in the second ploy, the third also begins to affect it. Many organizations suffer under this modality although they can maintain the formality of their organization, such as committee meetings, minutes and financial statements. But when they fall into the claws of the fourth ploy, the cooperatives function as entities privatized by their manager and/or president. The more ploys trap the cooperatives, the greater is the gap between the management/presidency and the members, and the more the cooperative is privatized. In the decade of the 1930s the price paid to the producer was 33% of the final value of the roasted and ground coffee (Wickizer, 1943). In the decade of the 1970s it was 27% (Clairmonte y Cavanagh, 1988), 15-20% in the decade of the 1990s (Pelupessy, 1999), 10% in 2001 (Mendoza y Bastiaensen, 2002) and 11.67% in 2009 (Mendoza, 2012b). In other words, the price to the producer fell from 33 to 12% in 8 decades. When we compare both chains, the price to the producer in relative terms (percentages) is less in the FT chain than in the conventional chain, even though it varies in absolute terms and sometimes it is a little more. This is due to two reasons: first, the price of FT coffee is higher for the consumer, while its distribution through the chain (roasters, buyers or importers, exporters, producers) is similar to the traditional chain. Second, the FT premium and the organic coffee premium reaches the members (producers) in an unequal way: some receive nothing for many years, and others get something. The variation in costs between the FOB price and the producer price is enormous, from US$20 to $45 from cooperative to cooperative. The tendency observed is paradoxical: if the cooperative is a second tier one and has high volumes, the gap tends to be larger, while if the cooperatives is a first tier one with less volume and a smaller number of members, the gap tends to be smaller. It is paradoxical because it should be the reverse, the greater the volume of coffee exported, the gap would be expected to be smaller, and the prices paid by the producer-member would be expected to be less. If the cooperative belongs to its members, why is it that in many cooperatives, particularly the second tier ones, do the bonus, the premium and the profits – or above-market-prices, “get stuck”? The responses range from “economies of scale”, “training and meeting costs” that the cooperatives incur, to new physical investments that never end. Another explanation is that some cooperatives are trapped by the mechanism of the “lottery culture” and the “Juan Garabato” strategy. The former is storing the coffee bought from the producers in warehouses, hoping that the price will spike and thus they will “win the lottery.” The latter is buying coffee from the producers at high prices in order to attain volume, and end up selling it at low prices because the price has dropped, a practice that is motivated by the idea that “the more you wait the better the prices will get’. In these cooperatives resources get hoarded in certain nodes and they then start going “downhill” from there. That culture and strategy generates losses in a cycle, so – as happens playing slot machines– they look to “make up for it” in the next cycle; if they lose again, their desire to “make up for it” is even stronger, returning to the “lottery” and “Juan Garabato” culture. These losses, added to the complaints or rumors of the membership about what is happening in the cooperative, make the management and/or some leaders desperate, who feel pressured to consider other additional avenues, like the one that follows. Prior to the 2006-2007 cycle, 100% of the coffee that the cooperatives exported came from its members. In that cycle the international prices for coffee began to increase, and fair trade in its entirety grew in volume. For example, the cooperatives in Nicaragua went from being 10% of the total exports of the country in 2006-2007 to 28% in 2011-2012. Also in that 2006-2007 cycle the cooperatives began purchasing coffee from third parties (non members), under the argument that they needed more coffee to fulfill their contracts with their buyers. And ever since that 2011-2012 cycle, the purchase from third parties has taken off, in some cooperatives getting as high as 70% of their total exports. This would seem to indicate that in some cases the purchase of coffee from the members is now primarily to “top off” the contracts that are made with the buyers in the name of the cooperatives. What is the problem of buying coffee from third parties? Conventional coffee bought from merchants, precisely the people the cooperatives emerged to fight against, is exported as if it were coffee from the cooperatives. In many cases, that conventional coffee is exported as if it were organic coffee. Given that the purchase of coffee from third parties (merchants and non member producers) is based on little or no control over the coffee quality, the mixing of coffee bought from third parties with coffee collected from the members affects the yield (volume) and quality of the coffee coming from the members. Correspondingly, the cooperatives that buy more coffee from third parties prioritize their resources for those purchases, which is why the members do not get loans with 0% interest, some members get loans with interest rates of between 12-20%, and the rest do not get loans under any interest rate at all. In other words, the more a cooperative buys coffee from third parties, the less it responds to its members. The more third parties sell their coffee to the cooperatives, the more the members lose control over their cooperatives. In a parallel fashion, the provision of the coffee of the members to their cooperatives has dropped since the 2006-2007 cycle. In a study done of 33 cooperatives in Nicaragua, Mendoza et al (2011) found that only 32% of the coffee production of the members was turned into (or sold) to their cooperatives. This means that the members are selling their products to other markets and that many are once again falling into the historical practice of selling their “future coffee”, a poverty-producing institution (Mendoza et al, 2013). Others reveal the resistance strategy of “one dirty trick deserves another”: “if the cooperative is buying coffee from all over and in turn is selling coffee grown with chemicals as if it were organic coffee, then if I get money I might as well put chemicals on my coffee and not say anything” ; and/or “I will only sell the coopeative a little of my coffee, in case some project comes in”. Under this scheme, the management/presidency of the cooperative responds less to its members and ignores their complaints, because they can buy coffee from third parties without demands for transparency, reports, loans or technical assistance. In the face of questioning these practices, the discourse of the management/presidency, and many times also the FT representatives, is: “we buy it to fulfill contracts…to get out of the crisis…to pay debts,” or, “because the members have low levels of productivity, to increase the harvest they have to grow using more land.” Such thinking would seem to suggest that they are buying coffee from third parties because of their unproductive members! And if the members ask for information, the respose is silence on the part of the management and FT system. Managers can frequently be heard to say: “outside organizations say that giving information to the members can hurt the cooperative.” Generally, the cooperatives that find themselves in this situation increase the centralization of information, which leads to the next step. In the beginning of the 1990s the cooperatives criticized the private owners of the dry mills for punishing them for the weight of their coffee (alleging it was delivered wet) and for its quality. 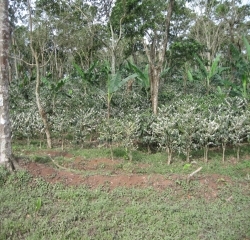 The cooperatives and the FT system understood that the quality of the coffee could be improved, that the cheating over its initial weight could be avoided, and there could be more fairness in the yield (resulting from the loss in weight from dry milling process), that the costs of dry milling could be lowered, and that obtaining better prices for the coffee was achievable. Correspondingly, the members –in many cases with the support of international aid and/or loans- invested in the construction of dry mills and their laboratories. In the first decade of 2000, the improvement in coffee quality of the cooperatives was felt within the country and the world, as well as the importance of the cooperatives and the small producer families. In the second decade of 2000, nevertheless, the situation showed signs of deterioration: many of the members repeated the same old complaints -this time against some of their own cooperatives- that they were being punished in the initial weighing of their coffee, that there coffee was being classified as imperfect (or second quality), and they were being punished in the cupping process. How does this punishment happen? A first dispute revolves around the weighing process, about whether the scales are calibrated differently in the numerous harvest collection centers that a second tier cooperative tends to have. In the case of companies like CISA and Atlantic, the scales of their different harvest collection centers are calibrated between the months of October and November, right before the harvest, that makes the scales uniform. The question remains about how correct the weight is given that the State does not supervise the calibration of scales. In the case of the private harvest collectors that operate with financing from CISA and Atlantic, their scales are not calibrated to the scales of the company, which is why we assume that each one uses them as they wish. In many cooperatives the scales in the harvest collection centers are not calibrated to the central scales in the dry mill. That is where the complaint comes from that “it weighed so much here, but there (in the mill) they said it had a different weight”, a greater loss of weight than what normally is lost during the trip to the mill. The second dispute is over the humidity of the coffee, which also has to do with its weight. The institutionalized rule that dates back some 6 decades is that there is no middle ground, it is either wet or humid (sun dried). If the coffee is wet, its value is discounted 56%, and if it is sundried or humid it is discounted 42%. In light of this, one of the achievements of the cooperatives in the 1990s was that their members got accustomed to turning in sun dried coffee (for a discount of 42%). In recent years, however, the complaint is that this “sun dried” reduction of 42% is getting closer to the “wet” reduction, and in some cases actually exceeds the already-unjust measure of 56% (see footnote 13). The dispute is over the procedure for determining those percentages, and particularly in terms of the rule of “either wet or humid (sun dried)”. There is a technology that shows the measurement of the humidity on a monitor. It is used to measure the humidity of export quality coffee before it is shipped, which should be between 10-12%. But this apparatus is generally not used in the harvest reception centers when receiving the coffee from the producers. In the harvest collection centers, those who do the weighing explain it self-confidently: “it is easy, you grab a handfull of coffee and if it sticks to your hand, the coffee is wet, and if it does not, it is humid or sun dried.” Experience shows that 100 lbs of wet coffee when it is dried (“spread on the patio”) to 42% humidity, can lose between 7 to a maximum of 8lbs, but not 14 lbs –and obviously not 28 lbs! The third dispute is over the percentage lost through the hulling. In Table 1, 15.5% appears (under “hulling”), but in many organizations it tends to reach 18%. The variation depends on the variety and quality of the coffee, and also on its handling. Table 2 shows the calculations for converting APO coffee to APS coffee.The accepted conversion ratio is between 2.02 and 2.06qq APO to 1 qq APS (gross export quality); 206 lbs of APO is equal to 100 lbs APS (Table 1.) Nevertheless, in the last 6 years that conversion ratio in the case of many cooperatives, and historically in the case of companies that own their own dry mills, has increased from 2.06 to 2.10, even 2.20 and in some cases 2.39. In the Table we see that 10,000 lbs (100 qq) APO, with a 2.6 ratio, equals 48.5 qq, and these 100 qq with a ratio of 2.20 ends up with 45.45 qq APS, 3.09qq APS less, which at a price of US$160 (minimum price + bonus) is US$490. A small producer with 1.5 mzs of coffee that produces those 10 qq APO, just in the dry milling loses close to C$14,000 (US$490), much more than the value of the FT bonus. If their second tier cooperative exported 50,000 qq, in a 2.20 ratio, using a point of reference of 2.06, their members would have lost 1,544.5 qq (US$247,131). If those ratios are 2.12, 2.16 or 2.35, calculate yourself the difference in terms of 2.06 or 2.04. A fourth dispute is over the percentage of imperfect coffee (see Table 1, far right columns). In the 1990s the cooperatives also improved the quality of their coffee, the members got accustomed to turning in clean coffee: “in trainings and in each meeting they would demand that we turn in clean coffee, and look, we have turned in irreproachable coffee, well picked, and in spite of this they would tell us that we do not have quality coffee. In contrast, if I sell uncleaned coffee to a buyer, he takes it and pays me right away” (member of a cooperative, 2015). From this it is alarming that today high percentages of imperfect or second quality coffee are being reported. How does imperfect coffee get calculated? 350 grams of coffee are removed from the bag and the number of defects are identified from that amount (see Table 3), they are weighed, and then the percentage of imperfection is calculated. For example, there are 4 pirmary defects and 3 secondary defects, each one is weighed (e.g. 5 black beans are 2 grams, this 2 x 100/350 grams = 0.57%. The same is done with the other defects, etc. Then I add up the imperfection percentages and let´s say I get a result of 2.5% imperfections in the sample. This gets applied to the total amount of coffee. SHG (strictly high grown) is specialty grade coffee, and has to be between 8 to 10 defects and none of those defects can be primary ones. Coffee buyers set the limit of defects for the coffee they are buying: the lower the percentage, the more the coffee is worth, and in the case that the buyer wants coffee with a lower percentage of defects, that means more work in the dry mill to obtain that percentage. It also depends on the market. Europe is more demanding than the United States in terms of number of defects accepted. The possibility for manipulating the imperfections is shown in the following: “if the buyer asks for a maximum of 12 defects for X price, and the managers respond by asking if the buyer would accept 15 instead, and the buyer accepts, then the managers report the required 12; the difference of 3 expressed in the percentage of exportable coffee they keep as their own profit” (cupper of a dry mill). This happens due to the absence of control or supervision on the part of the “owners” (coop members) over the dry mill, the deficient functioning of its committees, and because the fair trade and cooperative principles have not been internalized to prevent abuses. Finally there is the control of the sieve trays (that separate coffee into bean sizes) and the quality of the cup. They sieves go from size 10 to 20. Exportable coffee is from size 15 on up. The buyers propose a price for the coffee depending on the size of the sieve. If you want coffee from 17-18 in size, you pay more than for coffee from 15-16 in size. In addition, if you want a cup equal to or higher than a score of 85, then the price goes up. The quality of the cup of coffee (see Table 5) is calculated by its aroma, acidity, body, taste and residual flavor. The score is added up and 50 points are added (Chemonics International Inc, and Star Cuppers of Central America, 2005). The larger the sieve and the better the cup, the more the coffee is worth, and the more work is required to select the coffee that meets those requirements. The possibility for manipulation is based on the cooperative members not knowing that their coffee has a good size and cups well, therefore meriting a higher price and requiring less work. So they end up getting paid as if their coffee were not high quality and the proper size. If the cooperatives did advance in terms of having their members turn in sun dried or humid coffee (at 42% humidity) and better quality coffee, why did the conversion ratio reach and surpass 2.10, and why did the imperfection rate go up? It has to do with the increasingly more frequent purchases of coffee from third parties, coffee that generally is lesser quality and more humid. With the described manipulations due to the interests on the part of some of the administrative staff responsible for the negotiation and the management of the dry mills, and with the reaction of the members who are not careful about the humidity and quality of their coffee under the tactic that “one dirty trick deserves another,” the parties undermine one another and the producer are the ones who lose. Individual interests underly the cooperatives that fall into these ploys. Consequently the information about yields is zealously protected, not shared with the leaders of the first tier cooperatives, much less with their members. To a large extent it is due to the fact that the dry milling process lacks control by the committees of the cooperatives. This situation results in discontent growing among the members. The reaction of the managers to this is: “The coffee yield is low because of climate change, because of rust, because the members do not manage their coffee farms well and because they do not carefully pick their coffee.” Their favorite song is, “we are paying for water and stones.” In other words, according to this explanation, like with the purchase of coffee from third parties, the blame falls upon the member producers, in addition to climate change in this case. Some cooperatives that have gotten trapped in the aforementioned ruses, go broke. There are others that, in spite of having fallen into those ploys, persist. How? Behind their members´ backs, the management/presidency accepts proposals from some export companies: “NY price + 10”. That is, the export company proposes exporting their own coffee under the name of the cooperative, which means they are going to use the export license and FT certification of the cooperative. For that operation, the cooperative receives US$10/qq of the FT bonus, and the company keeps the NY price +US$10/qq of the bonus. There are also cases of non-member large producers who, out of friendship with the management of the cooperative, sell their coffee under similar terms. If the transaction is for 20,000qq, for example, the cooperative (or the management), without having collected coffee, “only lending them their documents”, earns US$200,000, like the private export company. And if the cooperative has organic certification? “NY + 25”. These transactions, that seem to be increasing year after year, generally are carried out by the managers of the companies and the manager of the cooperative. Some cooperative managers, on being challenged, argue that they are forced to do so to free themselves from the debt of the cooperative. In most cases, however, given the confidentiality that such transactions imply, and the huge gap between the management/presidency and the members, there are enormous personal earnings at the cost of the cooperative and the FT system. This reveals two governance structures, that of the companies with their managers, where the control mechanisms are enforced by their owners, and that of the cooperatives, where the control mechanisms on the part of their “owners” (members through their committees) are deficient and many cases null. This circumstance means that the cooperatives have reached the extreme situation of practically being privatized, functioning as such, yet presented as cooperatives. From this section we learn that there are many forces which compromise the success of the cooperatives and their members, including the prices (including the FT bonus, premium for organic coffee, quality differential, cooperative premium, extraprice or adjustment) that “get stuck”, extra losses for humidity, manipulations around the percentage of imperfect coffee and its quality, the “rental” of the FT seal and organic coffee certifications to large private enterprises. These multiple elements show the strength of these tragic ploys and the lack of control mechanisms, resulting in the privatization of the cooperatives, or parts of the cooperative, like the dry mill and/or the export services. The saying quoted at the beginning of the text, “even the most righteous man sins in the face of an open treasure,” captures the problem exactly. Anti-risk strategies can be used to avoid falling into the “lottery culture;” the “Juan Garabato” effect of buying coffee from members and not third parties; having better control over the dry milling process to control the humidity, imperfections and quality of the cup; increasing volumes of coffee without falling into the trick of the NY Price + 10;” and assuring the traceability of organic coffee so that it really is organic. Why are these not done? In this article we provide two reasons, the first in this section and the second in the section that follows (2.3). Here we argue that it would be difficult for a cooperative to fall into these tactics if the FT system (certifiers, social banks and buyers) fulfilled their role in a rigorous, transparent manner in accordance with the objectives of FT. If the organic certifier certified the real areas of organic coffee and ensured that the coffee to export was truly organic; if the FT certifier ensured that the minutes of the cooperatives are real, and that there was a rotation in leadership at all levels in accordance with the statutues of the cooperative; if the FT certifier ensured that the FT seal was used correctly and that the bonus did not “get stuck”; if the social banks ensured that the loans that they provide really were for the members and not for the purchase of coffee from third parties; if the buyers understood that they are buying coffee from a cooperative and not an individual, and made sure that the prices that they paid and the projects that they supported got to the members of the cooperatives; then, these tragic tactics could be avoided. Under this scenario, many cooperatives would not be going broke or privatized, the member producers would be turning in (selling) most of their coffee to their cooperatives, and the consumers in Europe and the United States would be sure that they were consuming organic coffee and coffee that came from cooperatives, and that they were contributing to small scale producers. Why and how does the FT system legitimize the cooperatives using such tactics? Figure 4 shows four responses to the series of questions. Even though the Figure, like an onion, shows that each layer is separate from the other, we want to show that there is an interdependency among them, and that one is reinforced by the other: a) the priority of the legal formality, b) the concept of the cooperative as “an individual” that becomes more visible based on the number of its members and its volume of exports, c) its depoliticized perspective and d) the assymetrical relationship of its loyalties. Formality refers to the requirements that an institution faces to access credit or to obtain a certain certification. The form is the way it operates. The certification and analysis of the cooperative is reduced to the formality of elements prepared by the administrative staff of the cooperative, mediated by the application of a “reasonable test.” This includes signed minutes of monthly meetings of the administrative council, records of activities on the organic farm, legal documentation of the cooperatives, financial statements, data on production areas and volume, and other similar formalities. An example from organic certification will illustrate. The information record on each organic farm is not analyzed by the certifying organizations, nor by the cooperative. It is only a formal requirement. 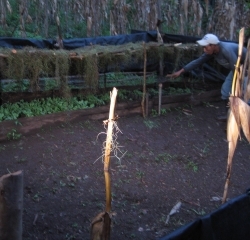 The formality indicates that the organizations are the ones that request the inspection of the organic certifiers, which is why they request that inspection at the end of the harvest when they are ready to export, which forces the certifier to stick to the formality of reviewing the product in the dry mill, and trust the data received. Consequently, the certifier cannot corroborate the origin of the coffee as expressed in the report prepared by the administrative staff of the cooperative, that x quantity of coffee is from such and such a cooperative and such and such a member. “If we would investigate that member, about whether he really turned in 40qq as the report says, the cooperative could sue us for doing a police audit” (inspector for an organic coffee certifier). At the same time, so many laws and norms have been produced to “ensure” that the organic coffee is organic, that other sectors with more economic capacity can buy conventional coffee and pass it off as organic following the “formality” process. Meanwhile, the most impoverished families are locked into producing organic coffee with low yields. “We are only left the pulp to use as fertilizer, and with this the rust disease had a greater impact on the organic coffee. When we buy some organic input they tell us that first we have to ask for authorization, and because of that paperwork we are not applying anything now” (member of a cooperative, December 2015). The paradox is that the more norms there are to ensure that an organic product is organic, the more conventional product passes as organic (see for example, subsection b of 2.1) , and the more the impoverished producers are intimidated. As the philosopher Anacharsis would say, written laws are like spiderwebs, they tie up the impoverished families, while those who have more resources easily break through them. Other examples have to do with the financial statements and audits, that are known only by the management and the financial director, not by the leaders, much less by the members. Because the important thing is that that financial information exists for the bank (social or not), without regard to what is going on behind those numbers, and much less that the leaders and members get to know them. A similar thing happens with information about yields, quality and prices, which are left under the exclusive knowledge of the managers. Meanwhile, the buyers know the price that they paid and the quality that they bought, and the leaders and members, as if they were not the owners of the cooperatives, are left in the dark. Added to this formality is the way outside organizations operate, a way that is mediated by an assymetrical relationship between the one taking the test and the one giving it, which means that the administrative staff of a cooperative cultivates the mentality of “complying” with what the outside organizations request, and the outside organizations cultivate the mentality of a “judge” who renders decisions (approves, punishes, suspends and cancels certifications, approves or rejects loans). That same relationship gets repeated when outside organizations visit a member to “verify”, in the face of which even the most honest and critical member of the cooperative takes on the role of “passing the test” to the extent that he falls in line with the directions of his manager. All this indicates how the conditions of formality and form facilitate the fact that the administrative staff, de facto, run the cooperatives, with each looking out for their interests through simply complying with the formality. The formality also covers the modus operandi of the outside organizations. Some of the organic coffee certifiers charge a percentage of the volume of organic coffee exported. This obviously conditions it to only fulfill what is formally required, and any attempt to find out more about the origins of the coffee could lead to the cooperative (management) prefering to hire another certifier, which would result in a loss of income for the certifier. Many second tier cooperatives and FT organizations, in addition, act as if they were NGOs implementing projects. All these practices distort the role of the cooperatives and at the same time time affect the member families. How does this distort them? The response can be illustrated with the following story, about a board member of a cooperative who tried to question the functioning of a second tier cooperative and was criticized by the FT representative: “You (members) have to love your cooperative (i.e. the manager and the centralization practices), because that is how projects will come in.” Here, “love” means shutting up, obeying and relying on the manager, which is contrary to the principles and practice of cooperativism. What explains this way of operating? FT emerged as a movement; still into the 1990s the cooperatives in Central America felt proud about being exporters, cooperativists, organic producers, receiving loans under favorable terms. 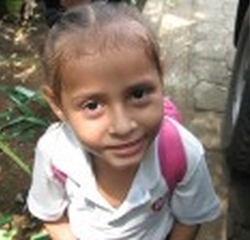 They received visits from FT organizations within an environment of social commitment, learning, high motivation, building horizontal relationships, all within a context of building an alternative and fair option in the face of conventional and unjust trade that used to hide all the information and manipulated the weight, quality and prices of their products. That FT process, to the extent that the volumes grew and a new generation of professionals entered the FT system within a now-depoliticized context (see subsection c), became institutionalized and “professionalized” (the formality). The certifiers developed their procedures, controls and ways of working, while the cooperatives turned into “businesses” that sold coffee, and into NGOs that implemented projects, providing reports to the donor organizations but not to their members. Slowly, the learning and movement nature of the process disappeared. Hence the greatest deficiency of the FT system is not having maintained the movement nature of the process along with its institutionalization. It was unable to convince the new generation coming in to combine their professional capacity with immersion processes, in order to nourish their spirit as they fought against and in favor of what they were working toward. They understood cooperativism as if it were an NGO or a business, without understanding its dual dimenions, of being an association and a business, and above all, being a means for the producer families to pursue the construction of a just system. This institutionalized deficiency makes FT organizations unable to detect when conventional coffee from third parties passes as organic coffee and as a product of the cooperatives, because their way of verification ends with the table of information that the administrative staff itself prepares for them, and because their interest is reduced to the financial revenue. They cannnot – and many do not want – to discover when the minutes are fabricated in lieu of meetings, even reaching the point that the signer of the minutes, because he takes on the role of “passing an exam”, says what the outside organizations want to hear, showing them with satisfaction what such groups want to see, because he thinks that “passing the exam” (deceiving) is “being clever”. Even though they know that there are leaders that remain in their posts in violation of the statutes of their cooperatives, the outside organizations see themselves forced to confine themselves to legal documents that confirm that the leaders were just nominated to their posts. Likewise with organic coffee certification, it does not matter so much whether a product is organic or not, what matters is complying with the formality. They cannot understand that a FT bonus “got stuck,” because they rely upon the formality that minutes exist from an assembly which is held once a year that approved this “blockage.” Can a rational person imagine that an assembly, meeting once a year, would make the principal decisions of an organization for an entire year? The FT organizations cannot contemplate the fact that the money provided by solidarity stores (or cooperatives) in Europe to the coffee cooperatives as prefinancing gets “stuck” someplace in the chain of actors without getting to its destination, because “that would be to interfere in the life of other organizations, it would be to do police investigation, and we could even be fired from our organizations for that” (director of a certifier in South America). This institutionalization and professionalization entails two ideas. The first is that of ‘homo economicus’, the rational individual who maximizes his earnings, which erodes the process character and “alternative movement nature” behind the idea of homo reciprocans, humans who seek cooperation. This perspective makes them look at a cooperative as if it were an individual, reducing it 100% to its economic interests. Along with this idea is another: understanding that a good organization is one that has large physical investments, hundreds of members, specialized in a crop trading large volumes of coffee. This idea underlies the approach of Fordism, named after automobile pioneer Henry Ford: specialized work, mass production and consumption (Best, 1990), very close to the ideas of Taylor (1911) on organization, separating brain and hands to increase productivity and effectiveness, and close to the traditional idea of the large estates, in their form of governance and their extensive and monocropping production system. This combination or sum of ideas would explain why coffee volume is prioritized and pretexts like climate change are sought to justify the stagnation and decline in product quality. It offers reasons to explain the division within FT, where FT-USA sought volume as the argument to impact more people, and FLO stayed with “small scale production.” In practice however FT is committed to volume, (e.g. 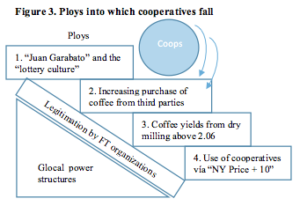 with purchasing coffee from third parties and the FT seal being used by large businesses).The FT system pressures grassroots cooperatives to come together into second tier cooperatives that committed to volume, and yet they do not pay for the crop quality that groups of members and grassroots cooperatives are producing in a differentiated fashion. So the members are cornered into only working on production, and the first tier cooperatives into only having legal existence. If the vision about a cooperative is that it is like an individual, then the formality and formal procedures carried out by FT organizations to certify and make decisions on credit and purchases described in the previous subsection are optimal for those purposes. If the outside organization is dealing with “an individual”, then it assumes that it only has to be based on the formality and it sticks to its form; and if in addition this individual per se is a homo economicus, and all the information is centralized, then their relations are reduced to the economic aspect only. In equating the cooperative with the management, the organziation legitimizes their permanence in that post regardless of their work, and at the same time ignores all the organizational machinery that the cooperative implies. Some organizations go even further, naming some managers as representatives of the cooperatives in international bodies (and/or brands), without such managers being members of the cooperatives where they work, and without consultation with the committees of the cooperatives. Bringing in the mythology quoted at the beginning of this text, the seduction of the “sirens” is that the fight for individual well-being overshadows the collective interest, and in desperately seeking that individual interest, everyone “goes mad”. From the perspective of the outside organizations, in the mythology referring to Ulyssess, the rowers and the sirens are read as something “individual,” as isolated actions (the cooperative, for its part, each certifier on their part, the social banks on their part…). In reality that mythology talks about a collective arrangement with the paradox of “tying themselves up to free themselves.” In FT language this could be mutually controlling one another to improve, something that currently seems non-existent. The “should be,” referring to the desires for a type of cooperative that is wanted, hides what “is,” the reality of each cooperative. “Should be” expresses collective interests mediated by a perspective of “harmony,” that feeds into the prevailing discourse and hides the conflicts that could express different development paths – recovering the alternative nature of the cooperative. What “is” refers to the way in which the cooperatives fall into the described ploys and institutionality, the way members are excluded from the decisions in their cooperatives, or the way women are ignored. If the bodies of a cooperative are not functioning (education committee, oversight board and general assembly), that reveals conflict and the prevalence of individual interests over collective ones. The cooperative is seen as only the economic part, separate from the social and political aspects. The actors of the chain appear focused on the business of producing, processing and selling coffee, on the credit services. This is coherent with the traditional approach of economics, which says that to increase production (output) you only need to add inputs, which is also repeated by producers who think that by taking credit (capital) they will improve their production, or with more projects they will quit being poor. Within the confines of this perspective, the prominence of the management, administrative and technical staff grows in importance. The formality contributes to an environment where the management takes initiative, because the different outside organizations make connections only with the manager, because of the formality itself, and therefore only with the business component of the cooperative, as if the cooperative consisted in just the business side. This separation of the economic from the political and social, like the separation of the visible (input and output) from the invisible (power relations, human skills), makes the role of any committee to be seen as functional vis a vis the economic part. Thus, the education committee in the cooperative, for example, is seen as separate from the economic and political aspects, and as something non-existent, except as a formality. The fact that the committees are not functioning, combined with the mutual “lack of oversight” and the formality of the general assembly, result in political decisions that – said figuratively – untie “Ulyssess” and the “rowers”, leaving them at the mercy of the “sirens.” The result is the marginalization of the leaders linked to the associative (social) side of the cooperative, and the negation of the political aspect of the decisions made by the economic side (administrative/technical staff), under the cover of good administration. FT organizations, feeling comfortable in their role of issuing a judgement supported by the financial side, are slowly being governed by “market justice” and not by “social justice.” In the face of the ploys that the cooperatives are falling into described above, it is hard for the outside agencies to argue lack of knowledge; on the contrary, they are a principal part of the legitimization of those deeds. “Market justice” logic is being imposed. The social banking sector is established with the purpose of generating earnings. Correspondingly, if previously it only worked with cooperatives, now it is also working with private enterprises: to continue calling them “social banks” serves their economic interests as a marketing label. Coherent with the logic described in subsecions a,b and c, the social banks provide credit to private enterprises without ascertaining that many times they are the refuge for people who made the cooperatives go broke, and who continue to undermine the cooperatives. The banks did not discover this because the formality and the form kept them from doing so. In the case of FLO, its division can be seen as an expression also of a double standard; it was founded to work only with small producers. Now with FLO divided, its FT-USA version also works with large coffee plantations, in the face of (or against) those for whom FT precisely emerged. Among the buyers, for example, Green Mountain was established within the original FT framework, but now can forgo the FT seal to dedicate itself to generating profits, because the market demand for FT seal has lost importance – “business is business.” The FT seal was a means for small producers to sell their production; along the way that seal became more a means for large enterprises to expand their markets. This “disloyal” practice is reproduced down the line. In the end the FT system ends up demanding loyalty of the consumers and member producers, while FT is untrue to them. The song that is heard in bars seems to express the feelings of the members (consumers and producers): “beat me but don´t leave me.” The FT system seems to respond to that like the stereotypical macho: “I have the right to do so, because I am a man.” The loyalty in any case is to capital. In the previous section (2.2), the question was asked about why the cooperatives were not able to overcome these perverse tactics. Here is a second answer. The cooperatives would not fall into these ploys if their members really acted as members, and their bodies functioned, and their staff responded to the principles of cooperativism and its bodies. The deterioration of FT also has been due to the action of a small elite that, behind the backs of the cooperatives and FT, have been appropriating – or privatizing – the cooperatives and FT. This group is based on an historical power structure capable of hollowing out the cooperatives. How? Figure 5 expresses the concentration of power (capital, positions of responsibility, information and contacts) that runs the entire chain. Seen from the region, the second tier cooperatives concentrate the investment based on a good part of the bonuses, premiums, price differential for quality, cooperative premium and earnings (or above market prices). They are the “door” to the certifications, banks, markets and FT organizations, to information and external relations, and they are the ones who have what the development organizations are looking for: reports, records, minutes, and information. Seen from the entire chain, the “iron circle” exists between the second tier cooperative, the buyers, the certifiers and the social banks. Seen from the view of the power relations, even though each organization acts according to their own interests, a tacit collusion is seen among various actors of the FT system. Historically the patron and the foreman lived in the same community/zone of the peasant families and/or fieldhands, a closeness that created more vertical control (of the patron over the foreman, and the foreman over the peasant/fieldhand), and kept the peasant families or fieldhands from taking advantage of their leverage, like paying with less product or working less than planned. The patron kept a firm control over the foreman through informal rules and the knowledge of what was happening. He thus kept the foreman from taking advantages of his position. Since the 1980s this structure has changed, it has been globalized. In FT the equivalent of the foreman is the administrative/management staff, in some cases along with the president. They manage the entire chain because the “new patron” of FT is geographically very far away, is full of formalities (laws and norms) and does not know the local reality. A constant feature of both the old and new structure is the ongoing exclusion of the peasantry (members of the cooperative) from that structure, and yet the peasantry has internalized that structure and reproduces it. Another constant feature is that this internalized, informal structure is what controls the formal structure with the support of the concepts expressed in 2.2. That structure is the historical institution of patron-client relations in our societies. This institution says that “women do not have the right to inherit land, only men do”, and that has been this way for centuries. Even the most democratic “agrarian reforms” have reinforced that institution, and the FT system has been absorbed by that structure. That institutionality also says, “fieldhands and peasants do not have the right to ask for information, the patron is the owner and he has the right to not share information,” and that has been this way for centuries. The FT system assumes and reinforces that institutionality: the manager, president, outside organizations all appear to the member families as the “patrons” that have the right to not provide information. It is common to hear one or another manager say, “not even my own mother-in-law knows that information.” And these “patrons” see the members as “ignorant” and “incapable” of improving the quality and productivity of their coffee. The members see themselves as impotent in the face of their cooperatives, cooperatives that appear to be distant from them and never seem to be “their” cooperative. All of this reminds us that historically peasant families have lacked real strategic allies. We could almost conclude that outside organizations have come in to use them. Some came to form communal banks, and ended up creating their banks, but left the most impoverished families outside their credit policies. Other organizations came in to sell products with the peasant families, and then consolidated their intermediary relationships, and left the peasant families as just the providers of products. And others came in to increase their numbers of guerrilla fighters and soldiers, who, after the dictatorships were overthrown, abandnoned them, leaving them to their own fate. Said figuratively, the peasant families have been like “lovers” for “a few nights;” they were never seen as spouses of a real alliance (marriage). Under these conditions the first tier cooperatives are not able to influence the second tier cooperatives. If they try, a wall appears: “FT and the social banks say that you cannot remove me (said a president of a coop), because my signature is on the contracts.” Or if there is a change in FT´s favorite manager: “if you change the manager, we are not going to buy your coffee”. If some cooperative dares to save and manage itself, ceasing to be “minors”, they get rained on: “you do not have FT nor organic coffee certification, and they are not going to give it to you, and no one is going to buy your coffee because you don´t even know who the buyers are;” or “if you do not continue together as a large cooperative run by the manager, I cannot buy your coffee.” If committed scholars look for information in FT organizations, the response is: “we can only give information to the cooperative” – read as the small group that controls the apparatus and keeps their leaders and members from knowing financial and trade reports. And from what was seen in section 2.2. the bodies of the cooperative are often non-functional, reduced to the formality of having an assembly once a year and a meeting of the administrative council once a month, and keeping minutes. All this explains why the technical-administrative staff acquire so much power, for example, in managing the humidity, the APO-APS conversion rate, imperfect coffee, quality of the cup, decisions about prices, loans, projects and nearly any other issue affecting the cooperative. This type of “transnational collusion” is what has hollowed out the content of the first tier cooperatives. Most of them no longer have credit and loan services, some are not even collectors of the coffee harvest. Their boards do not meet monthly, even though “minutes” of monthly meetings exist. Their members are unaware of the different activities and decisions in their cooperatives. The solely financial motivation for being members of a cooperative has become internalized, as well as the sense that they have to depend on the “patron” to receive “favors” (credit, projects). And this contributes to that “transnational collusion” becoming further consolidated, because that collusion does not face a resistance capable of challenging it. The unintended effect of this is that FT regresses, and along that road the cooperatives fall into crises and go broke, or persist in privatized form, while the members are dispossessed of their organizations. The “new foremen” become the “prinicipal”. Following Greek mythology, how can you tie yourself up in order to free yourself? How can the FT system mutually control one another in order to improve? In order to cheat death, FT needs to re-invent itself. FT needs to create an awareness about the fact that the economic, social and political are all aspects of the same reality, and that they are present in every decision. Reclaiming the meaning of alternative trade with which it started is even more important today. It must recover the nature of a movement that FT had, combining processes and results, and turning its attention to the multiple realities of the organized peasant families and not to capital. FT systems must provide support so that the members, along with their families and the first tier cooperatives, walk with more and more autonomy, instead of insisting on the perspective of mass, volume and infrastructure. In this way, the FT alliance will empower processes of repossession, and make the “patron-foreman-client” structure be transformed, not so much so that the “new patron” controls ever more effectively, and that the members become “new patrons,” but to move to a more horizontal relationship, one of alliance among different actors. If a small group, caught in the underlying neoliberal ideas of the 1990s and 2000s, was capable of diluting its conscience for justice and eroding FT, it is the task of the entire FT system, and not just of one actor, to reclaim the mission of FT. How can this be done? A group with a growing awareness of FT must reclaim its alternative perspective and reconceptualize why trade is FAIR. To do so, the generation of professionals who are currently working in the FT system (certifiers, buyer companies, roasters and sellers of roasted coffee), who did not have the experience that the first generation had, dealing with unfair trade and working with the families that organized into cooperatives, should have opportunities for immersion. Spending from 3-5 weeks with member families and their communities and insertion opportunities, repoliticizing the FT intermediation processes and building a new vision of FT are necessary components to rebuilding the FT mission. This immersion experience will allow them to understand the injustice in which the families currently are living, to see how FT and cooperativism really work, to rebuild alliances with the member families, getting beyond the institutional “test-judgement” relationship, and to understand the importance of cooperativism in its dual role, as both association and business. This will help reorganize what we are calling the second generation of FT. Those staff can add the sense of mission about why FT needs to be reinvented to their professional background. Equipped with that immersion experience, following Figure 6, we propose reinventing FT. First, that the Solidarity Stores and the first tier cooperatives (SS-C) form a space for direct communication, including the possibility that one could be the member of the other. The idea is that the SS-C might be a space for learning and for the democratization of information about prices, loans and certifications. The SS-C should be a space for the review of FT policies to ensure that pre-financing, bonuses and premiums do not “get stuck” in the system and actually reach the producers, that consumers who buy organic coffee really are drinking organic coffee, and that the coffee really comes from the members of the cooperative. This is possible if the SS-C are supported by an alliance between an institute for development studies of countries in the north and another one of countries in the south, which carry out studies on the entire FT chain, and in addition, accompany the members of FT in their improvement processes (innovations) and the organization of their knowledge. In the south the institute would accompany the cooperatives and their members, and in the north the other institute would accompany the FT organizations, solidarity stores and corresponding enterprises. A process that is studied allows for the development of a longer term vision, and if the FT actors are also accompanied in their innovations, this will reduce the mechanisms causing the regression of FT.
Second, the certifiers (FT and organic) must be accountable to the SS-C entity, so that their audits and verifications contribute to good practices in the FT system. Examples of best practices include rotation in leadership, managers not usurping the roles of the cooperative bodies, FT seal and certification of organic coffee only being used for the coffee of the members, and 100% of the coffee sold by the cooperatives produced by the cooperatives. Let us remember, currently the members are only turning in a little more than 30% of their total production to the cooperatives. In a context of change where the members would trust again their cooperatives and FT, they could turn in as much as 80% of their production. Consistent with these changes, best practices would dictate that the certifiers, buyers, social banks and the cooperatives be an expression of an alternative trade movement by being transparent. This means that the financial and organizational audits, the data on organic certification, the prices that the buyers pay for the product as the contracts stipulate, the costs of processing the coffee (dry milling), the dry mill yields (degree of humidity, hulling, imperfect coffee and quality of the cup), the amounts of loans given to different clients, etc. are all available on the webpage. This presumes overcoming the myth that “making our information public provides weapons to the enemy,” because the only ones affected by these beliefs have been the member families, and those who have benefitted most from this myth precisely are the elites who have privatized the cooperatives and FT.
Third, the first tier cooperatives must develop savings and loan services, systematically increase their own equity, be responsible for the collection of their own coffee, measure the humidity with the support of appropriate technology (e.g. the “thermometer”), and decide about 100% of the bonuses and premiums. Each cooperative should have their own webpage where they disseminate information about their areas, production volume, gender of their members and inheritance planning for their sons and daughters. The second tier cooperatives should specialize in coffee processing, disseminate complete information on the yields, quality and prices at which they sell the coffee, manage the coffee lots by zones including the names of the members, ensuring that those who produce quality coffee get paid for that quality, and facilitating the development of the provision of services by their first tier cooperatives, depending on the opportunities around them and their capacities. FT and organic coffee certification should be done directly with the first tier cooperatives, and those certification services should be done at reasonable prices that don´t discriminate against those cooperatives. Coffee lab testing should be done of each cooperative with organic products, and an alliance should be developed with the members to improve the organic product and create a strong environmental awareness. Fourth, to keep the first tier cooperative from also being controled by a small group, work needs to be done also at the level of the member families, so that they expand their capacity for negotiating, investing and saving, discussing their problems of inequality and find their opportunities with all the members of the family. Here we are reclaiming the rural proverb: “the stronger the children are, the stronger their parents will be.” The stronger the members are, the stonger their cooperatives will be; the stronger the cooperatives are, the stronger the fair trade organizations will be. Fifth, the State in each country should include policies for controlling the weighing, humidity measurement, calculation of the percentage lost in the hulling and control over the quality of the cup. The State should increase the informational transparency of transactions throughout the entire FT chain. These provisions would contribute to a real reduction of poverty and inequality, empower the families and their organizations, contribute to forming shared leadership that responds to their members, and help to recover the professionalism of the staff that work in the cooperatives, turning down the volume on the new song of the sirens, that says ”in order to make money in the new millennium you have to be the manager of cooperative”. Based on these elements, the model would be “I support you, so that you sell your excellent coffee” instead of “I buy your coffee to sell it myself and keep the bonus, the premiums, the quality and the difference in weight”. Under this model, the producers would recover their faith, and turn in 100% of their coffee to FT, and the consumers would appreciate that really they are consuming organic coffee, and that the additional price that they are paying is going where it should. It would stop systematic corruption cases that are impoverishing the producer families. The social banks would recover their loans at lower costs and not only appear to be, but really be, “social”. The FT movement and cooperativism are public goods that belong to humanity. FT, like cooperativism, emerged as an alternative movement, but slowly tended to become an expression of Michel´s “iron law of oligarchy” (1915 (1911). The enemy was commercial intermediation as a producer of inequality, and the challenge has been getting rid of usury and accessing markets through a transnational alliance. Nevertheless, if we calculate the injustice via costs, weighing, dry mill yields, taking the bonuses and premiums, quality differential, and donated projects, the fact that producer families are impoverished, or that only very few are able to get out of poverty, should not surprise us. What does surprise us is that this is happening under the umbrella of “fair trade.” The system of injustice is like a spider´s web, it traps the weakest and leaves them at the mercy of the big spider of capitalism that produces inequality. The paradox is that this FT structure could be strengthening the intermediation that dispossesses peasant families of their cooperatives and making the inequality worse. Consequently, FT and the cooperatives run the risk of more and more just appearing to be “fair”, as Plato would say. Why try to rescue fair trade? The current situation is increasingly one in which different actors are understanding the problems and consequences of FT, and also the injustice of commercial intermediation. We are living a moment of scarcity in terms of external resources from international aid, which prevents the injustices that have happened within the FT framework from continuing to be covered up, and motivates the members increasingly to ask about their FT bonuses and premiums, to ask about why they are not being paid for the quality of their coffee, and they are beginning to ask about the weights, yields, as well. Why rescue fair trade? The more differentiated the product is (quality and organic), and the more this differentiated nature becomes recognized, the more the rural families improve their lives, by generating more income, learning more, cooperating more, and contributing more to their cooperative. The more differentiated the product is, the more necessary the cooperative movement is, with transparent and effective internal bodies, as well as the entire FT system. This is what reduces poverty and inequality. In light of this goal, how can FT “tie itself up” and avoid going mad under the spell of the “song of the sirens?” FT must reinvent itself with an alternative perspective, that of a movement, re-politicizing their processes, along with cultivating their own institutionality and volume of transactions. To do so, the generation that works in the FT system should open itself to experiences of immersion and insertion in both the south and in the north, rethinking a vision of FT focusing on the producer families and committed to improving the quality of their own products and their organizational processes. This includes creating a space for communication-learning between first tier production cooperatives in the south and commercializing cooperatives in the north to energize the entire FT system. Such relationships should be built on continuing research of the entire FT chain in its different expressions (economic, social, political, cultural and environmental), and on making all the transactions transparent, understanding traceability not just in terms of the product, but of all the actors that have something to do with the product. The Bible says, “Money is the root of all evil” (I Timothy 6:10). The experience of Alcoholics Anonymous (AA) is very inspiring, within the context that I just described: “In the history of AA a moment of crisis happened when the organization had assets. This was a reason for discord, so a principle was implemented of not having assets, that is why we do not have our own buildings, no do we accept donations” (Conversation with R. García, 2016). FT deals with assets. When assets only respond to the ‘homo economicus’ logic, they erode cooperativism and the FT movement. The big challenge is for FT to deal with their own assets under transparent rules of the game and undermine those ancient structures. This is reinventing the FT movement. It involves personal change (unlearning) along with changing harmful structures. We are not alone in this aspiration. Let’s move on this. Best, M., 1990, The New Competition. Harvard: Harvard University Press. Clairmonte F. and Cavanagh, J 1988, Merchants of Drink. Transnational control of world beverages. Malaysia: Third World Network. 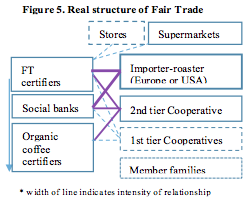 Mendoza, R., 1996, The structure of coffee market: A case to illustrate international trade and its impact on developing countries. Brighton: IDS. Mphil thesis. Mendoza, R., 2003, La paradoja del café: el gran negocio mundial y la gran crisis campesina. Managua: Nitlapan-UCA. 2003. Mendoza, R y Bastiaensen, J., 2002, “Fair trade and the coffee crisis in the Nicaraguan Segovias” en: Small Enterprise Development 14.2. Mendoza, R (coord. ), Fernández, E., Rodríguez, F.M., Zamor, R. y Delmelle, G., 2011, Estudio de Línea de Base del Proyecto Acceso a Mercados de Café Diferenciados. Managua: FUNICA. Mendoza, R., 2012b, Gatekeeping and the struggle over development in the Nicaraguan Segovias. Antwerp: University of Antwerp. Doctoral Thesis. Pelupessy, W., 1999, “Coffee in Cote d’Dvoire and Costa Rica: National and Global Aspects of Competitiveness”, en: van der Laan, H.L., Dijkstra, t. y van Tilburg, A. (eds), Agricultural Marketing in Tropical Africa: contributions from the Netherlands, Leiden, African Studies Centre Research Series 15. Wheelock, J., 1975, Imperialismo y Dictadura: crisis de una formación social. México: siglo XXI. Wickizer, V., 1943, The world coffee economy. California: Stanford University. The author has a PhD in development studies, is a collaborator of the Winds of Peace Foundation (http://peacewinds.org/research/) and associate researcher for IOB-Antwerp Universtiy (Belgium). rmvidaurre@gmail.com . I have followed the issue of fair trade since 1996 (See: Mendoza 1996, 2003). Many of the points of the text were discussed with E. Fernández, Y. Lanzas, E. Gonzáles and S.A. Granados, and reflected on with cooperative leaders and members in different workshops in the last 10 years. I am grateful for the comments of M. Lester and P. Marchetti on the draft of this article. I am also grateful to coffee buyers, certifier inspectors, administrative and technical staff of different tiers of cooperatives who, under conditions of anonymity, shared their experiences and perspectives. Even though strictly speaking current FT is composed of the FLO international organization (Fairtrade labelling Organization) and FT-USA (FT-United States), we call the “FT system” the series of cooperatives, certifiers, and buyers of products that act under the FT seal. Multatuli (pseudonym of Eduard Douwes Dekker) wrote a novel with that title (Max Havelaar) in 1860 where the protagonist, Max Havelaar, resigned his post as colonial administrator in Java (Indonesia) over the colonial abuse of forcing producers to plant coffee and sugar cane instead of basic grains, and imposing a tax system on them, creating a famine. The book awoke awareness that the wealth that was enjoyed in Europe was based on suffering in other parts of the world. This in turn resulted in an ethical policy of repayment by educating some local native groups loyal to the colonial government. In Green Mountain´s decision the change in ownership also played a role. The current owners, in contrast with the previous one, preferred to focus on the coffee business without supporting the institutional development of the cooperatives. Usury and the crop lien system, which is the ‘purchase of future coffee’at 40% of the value of the coffee. Both are centuries old institutions. See: Mendoza, Fernández and Kuhnekath, K. (2013). If the calculation is based on a cup of coffee, the price to the producer in relative terms is even less than 1%. This is due in large part to the costs of countless other ingredients and processes which are incurred to get a cup of coffee in the coffee vendors. We reviewed the receipts in the homes of the members where the amount of coffee that was sold and the prices paid are indicated. In general the members recognize that they have received neither bonuses nor premiums. Nevertheless, in the assembly of their cooperative they do not insist on it; sometimes, in conflict with what their receipts say, they even state that they did receive the bonus and premium. This happens when there is some outside organization present in the assembly, because prior to the arrival of that organization, the members are warned about the possible loss of future projects. Export cost is between $3-5, dry milling cost between $9-11, CONATRADEC is $2 and taxes go from $1-3; in other words between $15-21. The rest of the costs have to do with administrative costs, which in some cooperatives is impressive. In some cooperatives the producer-member is provided the possibility to decide when to sell his coffee (when the price will be set). The producer delivers his coffee and then monitors the international prices, and when he thinks it is at a good price, he wants the cooperative to pay him the price on that day. Other times the producer waits and waits and does not make a decision. These facts show that the “lottery culture” happens also at the member level, in those cases where their cooperatives allow them that possibility. This practice is also known as the “cat tactic”. Cats hide their pungent excrement under dirt and garbage, and then walk around without concern. This situation with the scales is repeated with all the crops, corn, beans, meat, pigs. It likewise happens with the coffee harvested, the can (or box) filled beyond a level top, and whatever does not quite fill a can does not get paid. In other places they do not talk about 56 and 42%, but about 14 and 7 pounds; that is, if it is received wet they deduct 14 pounds, and if it is humid or sun-dried 7 pounds. The operation is the same, 14 comes from subtracting 42 from 56. The alarming thing is that some cooperatives deduct 28 pounds when the coffee is wet, and then proceed with the yield of that coffee (taking it from APO to export quality) at 42%, which supposes that in spite of deducting 28 pounds for humidity, they deducted around 49% with around 18% for hulling – in other words they subtract 28 pounds from a 200 pound bag of coffee, and then apply a deduction of 49% on the remaining 172 lbs (=84 additional lbs), after deducting for the hulling, in the end 71 lbs APS are left. In traditional commerce, following the strategy that “one dirty trick deserves another”, the producers tend to react: “no matter how dry I bring in my coffee, they mark it down as “wet coffee”, so 6 kms before reaching the harvest collection center I dump buckets of water on my bags of coffee.” This “pyrrhic victory” nevertheless falls apart in the face of the response of the traditional merchant: “no matter how wet the coffee comes in, I deduct 14 lbs and then I put it out to dry. The most that coffee will lose is 7 and very rarely 8 lbs; in other words, at a minimum I gain the 6 remaining lbs” (see Mendoza, 2012b). APO coffee is coffee that has been pulped and sundried on the farm that still has the hull or parchment (Parchment sundried Arabic), APS coffee is that same coffee once it has been patio dried in the dry mill to bring it down to its storage humidity (Parchment dried Arabic). I want to thank N. Melgara and S. Granados for explaining this procedure to me. In the private sector generally the managers are the owners themselves, or their offspring, and they have supervision mechansisms to prevent manipulation from happening within the dry mills. The case of the Mennonite community can be very illustrative of the “internalization” and the control mechanisms. R. García (personal conversation, May 28, 2016) tells about how once he looked for support for training on cheese making in the Mennonite community in a rural area of Central America. He contacted the Mennonite vendor, who told him, “I can teach it because I know how to make cheese, but you would have to ask my Dad because he taught me what I know, it is his knowledge.” On another occasion he wanted to buy all the cheese that he brought to sell, and the Mennonite responded, “I cannot sell you all of it, why do you want it all? To resell? We sell cheese directly to the family, it doesn´t matter if it takes me a long time to sell it.” In other words, the Mennonites have their control mechanisms in their community, surely, that include being accountable. This example highlights the fact that the good principles have been internalized in such a way that they do not break them even when they are alone and outside of their communities. In contrast in the FT system, it seems, other ideas that do not correspond to FT have been “internalized.” (see 2.2. subsection c). These cases refer to cooperatives that changed managers and even members of the administrative council because of corrupt practices, leaving the cooperative in a situation with a large debt that forced them to resort to different means to continue existing as a cooperative. By way of illustration, see the sophisticated procedures of FLOCERT to request certification (http://www.flocert.net/wp-content/uploads/2014/02/CERT-Application-SOP-15-es.pdf), the certification process (http://www.flocert.net/wp-content/uploads/2014/02/CERT-Certification-SOP-29-es.pdf) and the audit (http://www.flocert.net/wp-content/uploads/2014/02/AM-Audit-SOP-17-es.pdf). Something similar was experienced in different areas. For example, international aid promoted development with participatory methods and processes in which their staff had a high social commitment. This has been changing. Since the year 2000 most of the aid agencies have sought “results” expressed in reports done by “professionals”, numbers that reflected “progress”. For a critical perspective on this approach see Chambers (2014). Mendoza (2012b) analyzes this structure as a structure of gatekeepers. This is understood as a transnational group that controls the keys to economic, social and political power from which they manage institutions and structures and take over material and non material resources. The following illustrates this. If there is a FT inspector or certifier that wants to verify the formal side, they get caught up in this structure: 1) “when the inspector comes, we in the cooperative prepare the members to be visited. If they want to visit some member that we had not put on the list, we tell them that he is sick or he is not home. The thing is to take him to members that we have already prepared” (President of an export cooperative, 2012). 2) “On one occasion, an inspector chose from the list without paying attention to our suggestions, and visited members who did not know the name of the president, so we tried to invite the inspector out to eat, to butter him up, but he did not accept it. In that case we had to write to his organziation arguing that he had discriminated against members, and the organization removed him as an inspector” (President of an export cooperative, 2012). Mendoza (2015), based in the experience of a group of development promoters-researchers, and taking from other experiences, argues for the importance of immersion (living with impoverished families), insertion (forming alliances and building a vision from that immersion), writing (taking notes and analyzing the information itself), and dialogue (listening to the logic of the different human groups). The social welfare state in Europe was due to a number of reasons. One of them was the experience of soldiers in World War II, who on entering homes to recruit youth, realized that many families were living in poverty, when everyone believed there was no more poverty in Europe. That experience awakened the conscience of many people and facilitated the building of the social welfare state, after World War II, precisely to not fall into poverty again and into war. (I want to thank T. De Herdt for helping me to understand this important part of European history). See: Drèze and Sen (1989), and Sen (1995). Why am I bringing up this historical reference? Because the power of immersion can be even greater than only entering the home of some families for a few minutes; the professionals that work in the FT system, like the soldiers that discovered poverty “in opening the doors of the homes”, can rediscover the injustice of intermediation in its different variations, including in their current experience of FT, doing it through sharing lives with the member families for some weeks. Some certifiers charge a cooperative that exports 2 containers of coffee (824 bags) an estimated $4,000, and they argue that in the case of having to do lab tests, the cost (US$300) should be paid by the cooperative. This seems like an excuse, because later they will argue that they need the authorization of the cooperative. Can a certifier that is earning a minimum of $4,000 not pay $300 for a lab test? It would seem that the intention is to not do lab tests, because the managers of the coops will look for certifiers that only legitimize their practices that go against the interest of the cooperatives.